Kota Kinabalu is situated on the tropical island of Borneo which was formerly known as Jesselton. It is the capital city of the Malaysian state Sabah. This place of international tourism is commonly referred as K.K within malaysia. This modern capital is one of the fantastic cities that offer warm hospitality to all its tourists. The tourist spot offers you long sandy beaches surrounded with paradise islands. You can also view series of virgin coral reefs and the huge Mount Kinabolu, situated in the background of the city at a distance of only 90 minutes journey. The location of this city is very amazing to make you fall in love with the place. Most of the hotels are located quite close to the airport. Have you ever visited a city which offers you a cluster of so beautiful islands? The city boasts off a marine park which is located nearby. It Comprises of five islands namely Pulau Gaya, Pulau Mamutik, Pulau Manukan, Pulau Sapi and Pulau Sulug which makes these places really stand out from other places of tourism. Moreover, the beaches here have crystal clear water along with sandy beaches. You can also enjoy viewing coral gardens and the reefs in shallow water. 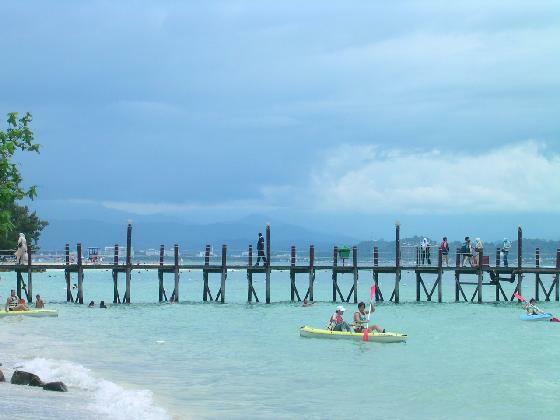 Another ideal location for all the tourists is Tunku Abdul Rahman Park, located nearby. It really gives you the glimpse of paradise. Take the underwater camera while you enjoy diving here. You can capture some rare marine creatures like blue-spotted rays, cuttlefish, mantis shrimps, scorpion fish, sea fish, and starfish. Tun Mustapha Tower which is 30-storeys and 122 meters high is quite a must to visit in your trip. The building is named after the third chief minister of the state who was buried in this memorial. This tallest magnificent building of Borneo is one of the hanging structures with a glass facade with 72-sided polygons and column-free floors. Apart from this City Mosque, Signal Hills, Museum and a giant Merlin statue are the other interesting things to see. The city is very well connected with the other parts of the world. The international airport of Koya Kinabalu (KKIA) comes just after the busiest airport of Kuala Lumpur in Malaysia. There are direct Flights from Kuala Lumpur and international places like Bangkok, Brunei, Hong Kong, Manila, Singapore, Taipei and Tokyo. Domestic flights from other Sabah cities are also available. The city is quite close to the airport and by taxi; it takes only ten minutes to reach the city center. However, at the airport, there is no bus service though you may get it at the main road. Bus service is the best to move around and visit the city. To get the best view of the city and feel it, one should walk around Kota Kinabalu. While walking through from Kota Kinabalu to Signal Hills, you are sure to view some amazing sights of the city and the islands. You can ferries too to have a close visit to the island and towards the Mengkabong Water Village. Another interesting thing about the area is that you can get bicycles on rent. So you can have a bicycle ride while visiting the city. There are a number of things that you can enjoy once you land here. It is your choice whether you want to enjoy the unbelievable endless natural beauty by walking or just go for a train to head towards the rain forests. You can enjoy all the water sports in the right type of temperature. If you like to enjoy in rains, then get ready to see the beauty of lowland rain forests and have pleasure of walking in the paths. Sports loving people can enjoy golf, sailing and some other water sports. Overall, the city offers you good accommodation and delicious food in affordable budget. It has one of the best hotels in Asia and in downtown Kota Kinabalu, you can find many business hotels. Apart from elegant dining in different restaurants, one can also enjoy varied flavours in a hawker stall. Famous not only for the beautiful resorts, Kota Kinabalu gives you many opportunities also to grow your business and for holding meetings. The chances to start your business here and grow are good as you have many direct flights from the other parts of the world. Enjoy whatever you like as you may never find another chance in your life to do all those fun activities and for the relaxation time to sit down and watch the beauty. If you really wish to see your dreams coming true, Kota Kinabalu is the place to watch out for.